Olivia Breen enjoyed the long jump competition of her life in front of home fans on Monday as she soared out to a personal best to win gold at the World Para Athletics Championships. 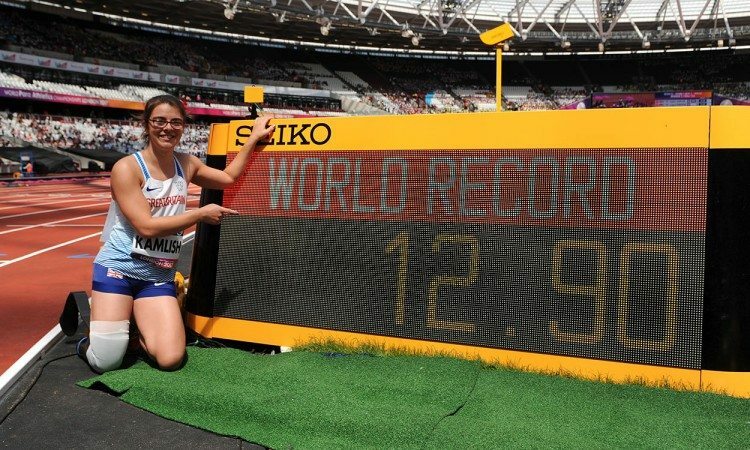 The 20-year-old had been left disappointed after her performances at the Rio Paralympic Games last summer but she bounced back in style in London to improve on her previous lifetime best three times in the T38 long jump, first leaping 4.72m in the third round to add two centimetres to her PB before jumping 4.81m in the fourth round. She further confirmed her fine form with a leap of 4.75m from her final attempt. Australia’s Erin Cleaver was second with a best of 4.61m, while bronze was claimed by Poland’s Rio third-placer Anna Trener-Wierciak. The European 100m champion, who formed part of medal-winning relay teams at both the London 2012 Games as a 16-year-old and the 2015 world championships, has switched her coaching set-up and now trains under Aston Moore in Loughborough. Among her training partners is Stef Reid, who herself claimed long jump gold in London on Saturday. 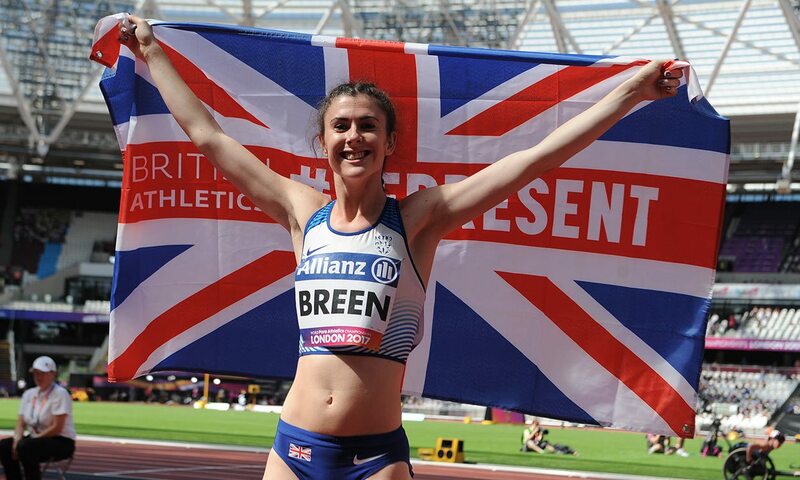 Breen has improved her PB by almost half a metre in 2017 and although the gold and silver medallists from Rio were absent in London, the Briton’s winning leap would have been enough to win in Brazil. “It’s disappointing looking back on last year but I’ve done it this year,” said Breen, who will also contest the 100m in London on Saturday. Breen was delighted to gain her gold in front of a home crowd too, even if she did have to ask fans to quieten down ahead of her jumps, which was tricky as she was competing on the loudest morning session of the championships so far with thousands of schoolchildren among the supporters. With 23,300 in the crowd, it was a world record for the number of schoolchildren in the same stadium at any one time. Another athlete to receive huge cheers was Britain’s Sophie Kamlish as the single-leg amputee sprinter broke her own T44 100m world record with a time of 12.90 in her heat. She will go up against double world and Paralympic champion Marlou van Rhijn of Netherlands and Britain’s Laura Sugar in Monday evening’s final. The now four-time world T42 200m champion Richard Whitehead was also among the British athletes to progress on the fourth day of action in London as he won his 100m heat in 12.35 to qualify for the evening’s final. His team-mate Dave Henson was fifth in 13.27 so will not join him in the next round. Britain’s Richard Chiassaro was among those to qualify for the T54 800m final but Nathan Maguire missed out after finishing sixth in his heat. USA’s para athletics star Tatyana McFadden smashed the championship record with 3:25.23 for gold in the T54 1500m as the wheelchair racer led eight more athletes inside the previous record mark, which had also been set by McFadden in 2013. It was her second gold of the championships after her 200m victory and she also contests the 400m and 800m in the UK capital. Rio champion Mikela Ristoski of Croatia gained world T20 long jump gold two years after winning the triple jump title in Doha. She jumped 5.66m in the event for athletes with an intellectual impairment, with Britain’s Martina Barber just missing out on a medal, her PB 5.17m placing her fourth. China’s Zou Lijuan won the F34 shot put with 8.23m, while Britain’s Vanessa Wallace was fifth with a PB of 7.64m. Rima Abdelli was delighted with her F40 shot put win after her PB 7.57m throw and she was joined on her victory lap by team-mate Raja Jebali who claimed bronze. Silver was secured by Poland’s Renata Sliwinska after she threw a European record 7.23m. Serbia’s Paralympic champion Zeljko Dimitrijevic broke the world record with a throw of 31.99m in the F51 club final.